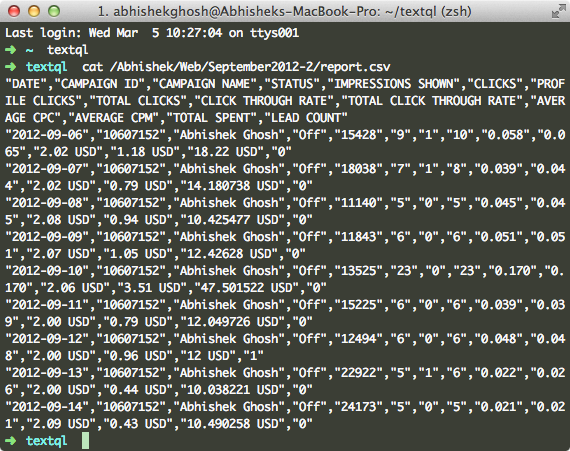 With TextQL, one can execute SQL against structured Text like CSV or TSV. One need to install GO to compile TextQL. Here is how to do from scratch. We are assuming that the user is either using GNU Linux or OS X, though we will describe the process of installing TextQL on OS X. It is kind of mandatory to read the instruction described here (and the linked article) – iTerm2, Homebrew and ZSH Installation on OS X. Homebrew has the package, although one can follow the direction in official Go language’s description. SQL like queries (counting, aggregating, joining,etc) demands using a full fledged database. Log parser is a powerful, versatile tool that provides universal query access to text-based data such as log files, XML files and CSV files, as well as key data sources on the Windows® operating system. If you have any dealings at all with data and databases, then you almost certainly will have have to deal with comma-separated values (CSV) data. Unfortunately, the CSV files you are given, or are required to produce, never seem to be in quite the right format for your particular business application. And because of the structure of CSV records, using standard text processing tools like sed, awk and Perl on CSV files is not as simple as it might be. Then, GO will work. 1.2.1 is the version. The script made the things easy. The project is good, but its official instruction is very poorly written. This Article Has Been Shared 6217 Times! Cite this article as: Abhishek Ghosh, "Execute SQL Against Structured Text Like CSV With TextQL," in The Customize Windows, March 5, 2014, April 21, 2019, https://thecustomizewindows.com/2014/03/execute-sql-against-structured-text-like-csv-with-textql/.